Perhaps no play in the modern theatre has so captured the imagination of the American public as Tennessee Williams’ masterpiece The Glass Menagerie. The young writer’s first successful play, it catapulted him from obscurity to fame when it premiered on Broadway in 1945. The Chattanooga Theatre Centre re-examines the play’s origins and undeniable power in its upcoming production of the classic, opening Friday, March 9, and continuing through Sunday, March 25. The play has strong autobiographical elements that mirror the celebrated playwright’s tumultuous life. Years after he left his mother and sister, Tom Wingfield struggles to absolve himself of the guilt of abandoning his family just as his father did. In front of the audience, he summons scenes from the past – 1937 in St. Louis – where he lived in a small apartment with his faded Southern belle of a mother and shy and withdrawn sister. There they struggled to get by financially, dreamed of the past and what could have been, and worried about what would become of Laura. The Theatre Centre production gives the work a compelling interpretation that will captivate audiences. Director Todd Olson, who joined the Theatre Centre as executive director last year and is making his CTC directing debut, turned to Williams’ original publication of the play, not the acting editions that evolved over time, to bring the story to the stage. 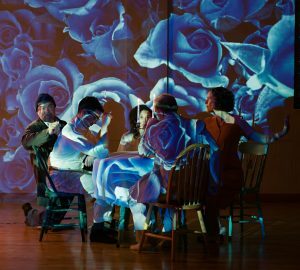 The CTC production is also distinguished by light projections by Philip Luckey that will illuminate designer Sarah Miecielica’s set. Perhaps the Theatre Centre’s most unique interpretation of the play is Olson’s choice to divide the central character of Tom between two actors. Veteran CTC actor Rob Inman plays Tom in the present, and directs his narrative to the audience as he reflects on the past. Christian Smith, who most recently appeared in Beauty and the Beast and A Midsummer Night’s Disco, plays the role of Tom in the past and interacts with the rest of the characters. The strong ensemble is rounded out by Magge Cabrera-Hudgins as Amanda, Tia Strickland as Laura, and Jacob Moore as Jim. Performances on March 9-10, 16-17 and 23-24 begin at 8 p.m. Shows on March 15 and 22 begin at 7 p.m. Matinees on March 11, 18 and 25 begin at 2:30 p.m. The show will be presented in the Circle Theatre with limited seating. Reservations are recommended. For tickets, call the box office at (423) 267-8534 or visit TheatreCentre.com. Just in time for Valentine’s Day, the Chattanooga Theatre Centre is pleased to announce a one-night-only presentation of A.R. 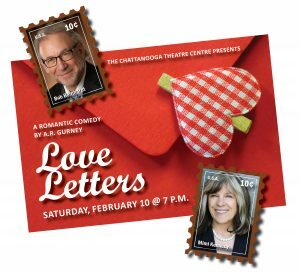 Gurney’s romantic comedy LOVE LETTERS, starring award-winning actress Mimi Kennedy and Chattanooga Symphony & Opera Music Director Emeritus Bob Bernhardt. A full evening of sweets, live music, and unforgettable theatre, this fundraising event is set for Saturday, February 10, with a reception and live music at 7 p.m. and the curtain rising on the play at 8 p.m.
Our production of LOVE LETTERS, a funny and emotional portrait about the powerful connection of love, will feature the talents of guest artists Kennedy, a film, TV and stage actress currently featured on the hit CBS comedy MOM, and Bernhardt, the CSO music director and conductor for 19 seasons who is beloved by Chattanooga audiences for his unique blend of dedication, commitment to excellence, and sense of humor. The evening will open with a reception featuring the tasty fare of Chattanooga Snack Attack’s Molly Follett, a specialty cocktail by Easy Bistro’s Nathan Rocha, and music by jazzy songstress Robin Grant. After the performance of LOVE LETTERS, VIP guests will be invited to an after-party and meet-and-greet with Kennedy and Bernhardt. LOVE LETTERS, a two-person comedy by A.R. Gurney, a prolific American playwright who passed away last summer, has been staged around the world with pairings of some of the greatest talents in theatre and the entertainment industry. The play is comprised of letters exchanged over a lifetime between two people, with the actors reading the letters aloud. The story is of two friends, rebellious Melissa Gardner and straight-arrow Andrew Makepeace Ladd III, who have exchanged notes, cards, and letters with each other for over 50 years. From second grade, through summer vacations, to college, and well into adulthood, they have spent a lifetime discussing their hopes and ambitions, dreams and disappointments, and victories and defeats. But long after the letters are done, the real question remains: have they made the right choices or is the love of their life only a letter away? What is created is an evocative, touching, frequently funny but always telling pair of character studies in which what is implied is as revealing and meaningful as what is actually written down. Bryan and Mindy Kelly are chairing the event, with proceeds supporting the 94-year-old theatre’s mission of enriching the cultural, intellectual, and emotional development of people of all ages by providing high-quality theatrical experiences and creating opportunities to engage in them. Individual tickets are $50. Special VIP tickets for $75 will grant patrons access to an after-party after the production at which they will meet Kennedy and Bernhardt and enjoy champagne and a signature dessert. For tickets, call the box office at 423.267.8534 or visit TheatreCentre.com. MIMI KENNEDY is a sought after American actress working in film, television and theatre. She has the ability to take characters from the pages of a script and bring them to life with ease and believability. Kennedy’s film work is as diverse as the actress herself, from her portrayal of the Assistant Secretary of State in Armando Iannucci’s IN THE LOOP to a woman suffering with cancer in Steven Soderbergh’s ERIN BROCKOVICH or as Helen in Woody Allen’s MIDNIGHT IN PARIS, Kennedy’s range is vast. Kennedy’s television career encompasses both drama and comedy, with starring and recurring roles in multiple series. In 2013, her portrayal of the recurring character of Marjorie on the award-winning CBS comedy MOM garnered her the nomination for best guest performer in a comedy series at the 4th annual Critics’ Choice Television Awards. In 2014, Kennedy was named a series regular. Also notable is her co-starring role as Abby on the hit television series DHARMA & GREG from 1997 to 2002. Other television roles included a guest starring role on HBO’s VEEP starring opposite Julia Louis-Dreyfus and ABC’s MISTRESSES. Kennedy’s acting career began on the stage; her most notable theater credits include acting opposite Sid Caesar as well as her portrayal of Jan in both the original Broadway and National Touring productions of GREASE. Kennedy’s career also extends behind the camera. Her experience includes the role of story editor for KNOTS LANDING during its ninth season and in 2013 as the Executive Producer of the documentary, My Country Is the World & the World Is My Stage. In addition to Kennedy’s acting career she is also a published author, and playwright. In 1996 her memoir, “Taken to the Stage: The Education of an Actress,” received critical praise for her candid and humorous writing style. Kennedy’s one woman play, “Mimi Kennedy Finds Matilda Joslyn Gage”, simultaneously tells the stories of the 19th century suffragist Matilda Joslyn Gage and Kennedy’s personal accounts of her life as a woman coming to age in the baby boomer generation. The one woman show explores the parallels between the lives of the two women and their commitment to political activism and social change. Kennedy is a versatile creative; she is an actress, author, playwright and political activist. This wealth of personal character is a well of knowledge that allows Mimi Kennedy the ability to perform any role with understanding and depth. Kennedy’s brothers, Dan and Jim, and sister Susan are residents of Chattanooga. BOB BERNHARDT, Music Director Emeritus and Principal Pops Conductor, formerly served as Music Director and Conductor of the Chattanooga Symphony and Opera for 19 seasons. He was the second Music Director in the combined company’s history, and is its first with the title Emeritus. Along with the extraordinary rejuvenation of our city, Bernhardt likewise led the CSO into its most exciting, hopeful and inviting period with his unique blend of dedication, commitment to excellence, and sense of humor. A lover of all genres of music, he is equally at home in symphonic, operatic, pops and educational performances.